Ballard is one of the hippest neighborhoods in Seattle and is located in the northwestern part of the city. Before incorporating into the city limits of Seattle, it had a large Scandinavian population who were drawn to job opportunities in fishing and boat building. Residents continue to take pride in their individuality from the larger city of Seattle, which is reflected in its culture and personality. With a quick 27-minute commute to downtown Seattle that is home to tech giants such as Amazon and Microsoft, this neighborhood is home to 16,000 residents. The median age of its residents is 39 years old and with a mix of young families and people who are single. The household income for residents is $41, 203, and the range of activities of things to do in this neighborhood keeps its residents busy and active despite an average of 37 inches of rain per year.To get in touch with the Scandinavian roots of this neighborhood, the Nordic Heritage Museum is a popular destination for residents and visitors alike. This museum honors the traditionally Nordic immigrants of Ballard with maritime, fine art, fashion, and historical exhibits. 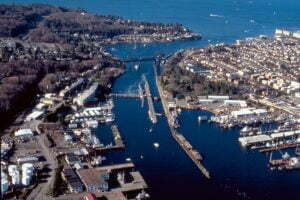 Walking along the marina or the Hirim M. Chittenden Locks can also provide an appreciation for the area’s maritime tradition and beautiful scenery that includes views of the Puget Sound and Olympic Mountain range. Though Washington is known for its rain, it makes up for it in the summer months with warm temperatures, greenery, and beautiful snowcapped mountains. Golden Gate Parks is one of the most popular places to visit during these months where you can enjoy sandy beaches, scenic forested hikes, and fishing. This neighborhood is also home to some excellent breweries where you can cool off with an IPA in the summer months or warm up with a stout in the winter months. Within 5 square miles, this neighborhood is the home to 11 breweries. Fremont Brewing is the largest of the breweries and their Jasmine IPA is one of the best. Washington and the Pacific Northwest in general have a wonderful agricultural scene that allows residents access to the freshest ingredients. As in typical Washington-fashion, the Farmer’s Market is open year-round, rain or shine, every Sunday. This can offer a great opportunity to do your Sunday grocery shopping with some of the best seasonal ingredients around while listening to live music and grabbing a bite to eat from one of its vendors. For the nights you don’t feel like cooking yourself, this neighborhood offers a fantastic restaurant scene. If you’re looking for a lighter meal or wanting to try several dishes at once, check out Ocho for Spanish tapas. Indian food always serves as a great source of comfort food on rainy days, and India Bistro is a known favorite that does the trick. The Seattle area is also known for its Asian cuisine, and Pestle Rock provides an authentic Thai food experience outside of the typical Pad Thai dish. Looking for a great burger or pub food? 8 oz. Burger and Company is just right down the street and can provide the classic American favorite as well as more adventurous options like wild boar burgers or toppings like smoky bacon mayo or fire roasted habanero jam. Given that this neighborhood is home to primarily younger residents, the majority of residents are renters. Average rent prices range from $1,400 for a studio apartment to $2,309 for a two-bedroom apartment. Despite the area’s popularity, rent prices have surprisingly decreased within recent years. Ballard is a popular neighborhood for current or perspective residents looking to purchase real estate as well. The median home value is $640,300, and unlike rentals, home prices have seen a steady increase in price over the past year. Price per square foot is $523. Home prices are expected to increase another 4.9% in 2018, so if you can get into the market, investing in this area is promising. Public schools within the area are part of Seattle Public Schools, which educates 67% of students in the area. This neighborhood is home to one elementary school, Adams Elementary School, rated at a level 6. Though most people drive, public transportation is also available to residents who work in Seattle where parking might be limited. This includes the D-line Rapid to Downtown Seattle or the University District home to the University of Washington. This area is also biker and walker friendly with scores in the 80s for bike and walk scores. Although it is one of the more expensive neighborhoods of Seattle, Ballard is well worth it for those looking for a balance of a smaller community with big-city amenities. Our property management team specializes in residential areas throughout Ballard, WA. We offer multiple services to take your rental property and convert it into reliable income. We have a thorough screening process that helps to identify the right tenants for your property. Our team works hard to keep both parties happy through effective communication, bullet proof lease agreements, and timely monthly rent collection. We offer maintenance services to enhance the property and ensure that it will retain or increase in value. We oversee everything, allowing you to sit back and relax and know that your property and your tenants are in good hands. Contact us today if you are ready to receive a comprehensive analysis of your rental property and to inquire about our Ballard area property management services.